There is nothing better in life when you combine sports, traveling and volunteering.. 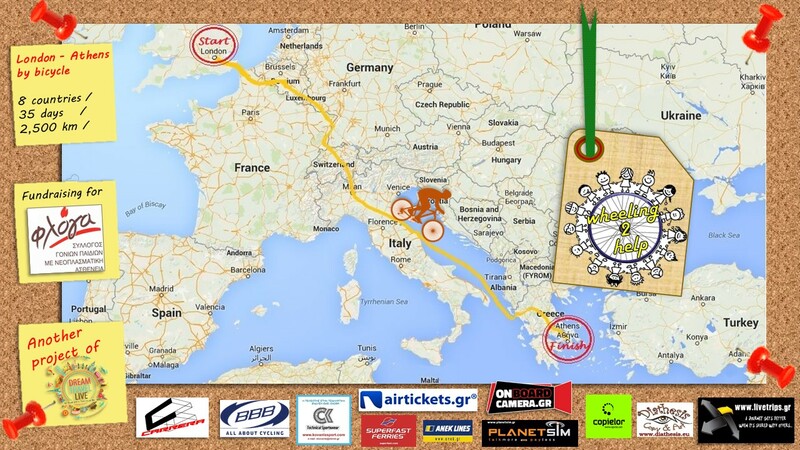 Since I am already working in the UK, the plan is to cross Europe from London to Athens by bicycle raising money for children with cancer of the ”Floga” organization in Greece. I am not a professional cyclist but I truly believe that if you really want something, you will definitely make it! wheeling to spread the love and compassion to all the children with cancer. The expenses of the trip are minimal and I will cover them myself, actually it is just the food, as there is no transportation costs (hehe) and with regards to accommodation, I will arrange to be hosted by locals in every stop through couchsurfing and warmshowers. The goal is to inspire people and companies to be on board for this project and help us raise 10,000 euro for these little angels and heros that fight every day to beat cancer. During my stops in the Greek cities, I will organize various cycling, volunteering and sport events in collaboration with the municipalities and regional clubs, any help and ideas are more than welcome! TAKE YOUR BICYCLES AND JOIN ME PEOPLEEEEE! I want to shout out loud and invite all of you to join in any part of this trip, it will be an unforgettable experience for an amazing cause. Don’t hesitate to contact me and ask for more information. We are Elpis and Dora, a young passionate crazy couple from Greece that want to inspire our life with new things we see, live and experience in this wonderful planet! We love traveling, cycling and exploring new cultures, traditions, getting to know new people and trying to have as many unique experiences as possible! After a few backpacking trips in Europe, Asia and Africa, the time has come to explore Europe by bicycle and raise awareness for children's cancer. This time Dora, will have some rest, and will join me during the Greek part of the journey. Few months ago, we crossed Africa from Cape Town to Cairo in 6 months with our tent and backpack using only public transport (more than 350 buses, minibuses, etc). At the same time, we managed to raise about $20,000 via 3 crowdfunding campaigns and helped orphanages, dispensaries, a school that we built, even a water well that gave access to safe drinking water to more than 1,200 people. We filmed all this amazing experience in a beautiful documentary ‘’AfriQuest : Crossing Africa giving 3,000 smiles’’, which you can watch here, https://www.youtube.com/watch?v=l9rU-MWhbcM . Accomodation - maybe you know someone that could host me in one of the cities that I will pass. Tips - any relevant information is always useful (about cycling routes, preparation, nutrition, anything)! Company - you are more than welcome to join us for a part of the trip! Become an ambassador - help us reach the tough goal of 10,000 euro. Keep Helping & Carry on! Ένα μοναδικό ταξίδι αγάπης και αλληλεγγύης έφτασε στο τέλος του. 8 χώρες, 35 ημέρες, 2.500 χιλιόμετρα με πολύ πετάλι, αρκετή βροχή αλλά ακόμη περισσότερα χαμόγελα! Μια τρελή ιδέα που σιγά σιγά έγινε κίνημα εθελοντισμού και έμπνευσης για πολλούς! Το ελληνικό κομμάτι ήταν αρκετά ξεχωριστό, καθώς είχα και παρέα να με συντροφεύει, οργανώσαμε πολύ ωραίες εκδηλώσεις σε Ηγουμενίτσα, Γιάννενα, Καλαμπάκα, Τρίκαλα, Λαμία και Αθήνα, μας υποδέχτηκαν και εμπνεύσαμε χιλιάδες παιδιά και γίναμε όλοι μαζί μια αγκαλιά για τον παιδικό καρκίνο. 24 hours left people, hurry up!! This amazing journey might have finished, the initial goal of 10,000 euro might have been reached, but the needs of the Floga organization are much bigger. We have 24 hours more to do a last try, shout at our families, friends, anybody that would be interested to support this wonderful cause! Tomorrow is my last day in Italy before I take the ferry from Ancona to Greece, and I am sooooo excited! 25 days on the road, almost 2,000 km so far and the biggest smile ever in my face! Christina joined me for a week in Italy, we passed through beautiful small cities, had amazing weather, food was just incredible and the route 100% flat! Thank you from the bottom of my heart for your support towards our #wheeling2help project, we are now entering the last 10 days of the project and we have reached 71% of the initial goal of 10,000 euro, let's all together push it as much as we can! The last days have been amazing, cycling along rivers and amazing countryside! Belgium, Germany and France have all been very welcoming and we haven't experienced any big issues.. The only bad thing is the weather, it has been raining everyday for the whole week, so everytime we end up completely wet and can't wait for a warm shower to feel better and dry our clothes! Paris and Martin have left since Tuesday, so since yesterday I am cycling alone, with the little teddy bear, Wheely :) Hehe! Today is my last day in France, as later in the evening I will be entering Switzerland.. The power of giving is the ticket to changing the world! There are no honestly words to thank you for the overwhelming response to this wonderful cause! Within less than a month, we managed to raise 48% of our initial goal of 10,000 euro for the children with cancer of Floga. It is just amazing and I really really want to thank you one by one from the bottom of my heart! Regarding the trip, we are now in Brussels, Paris will keep me company for another 6 days until we reach Strasburg, and then I will continue alone until Lake Como where Chistina will join me! The weather has been mostly great, aparta from one day that there was a lot of wind and rain, and next day I had to put plastic bags between socks and shoes as they were totally wet, hehe! Tomorrow we will continue towards the South of Belgium and then enter Luxemburg.. I will definitely keep you posted! It is Saturday late night, trying to put my thoughts in an order.. 7 days left, it is getting soooo close! I have been talking and thinking of it a lot, but the start in London is now around the corner! I have created a facebook event as well for the start, it would be nice to have some people joining for the first few kilometres, even for a quick chat, I would really appreciate it! We are going to meet on Saturday 5/9 at 10am @ London Eye to make a beautiful picture all together and off we go! I have already received the bicycle sponsored by carrera from Greece, clothing equipment from kovanis, action cameras from onboardcamera.gr and I am currently fixing some last minute needs.. The project is getting more and more exposure, a lot of people are supporting us in many ways and this is very encouraging to work harder and harder for these little angels! Within the first 3 weeks, we have already achieved 15% of the goal of 10,000 euro and I want to thank you from the bottom of my heart for this overwhelming support! Today is the first day of our #Wheeling2help campaign and I am extremely excited and motivated to work hard for this great cause. Kindness and compassion is something that we must always keep in mind, caring for our fellow citizen, helping when needed.. There is no better feeling in life than when you make somebody smile, sharing something with him and spreading the love..
Our 6 month experience in Africa changed us a lot, we realized how useless is money and goods compared to love and happiness. We keep asking more and more, when other people do not even have the basics. Let's try to raise awareness to everybody about children cancer and get people involved in this project..